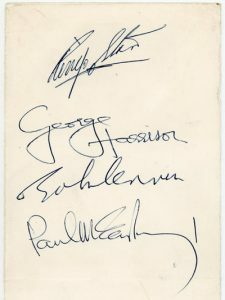 Authentic Autographs Examples of The Beatles. John Lennon, Paul McCartney, George Harrison, and Ringo Starr. An English rock band formed in Liverpool in 1960. 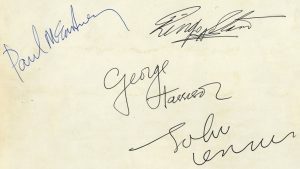 With members John Lennon, Paul McCartney, George Harrison, and Ringo Starr, they became widely regarded as the most influential music band in history. Rooted in skiffle, beat and 1950s rock and roll, the Beatles later experimented with several musical styles, ranging from pop ballads and Indian music to psychedelia and hard rock, often incorporating classical elements and strange recording techniques. 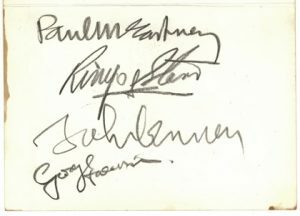 In 1963, their massive popularity first emerged as “Beatlemania”; as the group’s music grew in sophistication, led by primary songwriters Lennon and McCartney; the band was integral to pop music’s evolution into an art form and to the development of the 1960s. They built their name playing clubs in Liverpool and Hamburg over a 3 year period from 1960, with Stuart Sutcliffe initially serving as a bass player. The core trio of Lennon, McCartney, and Harrison, together since 1958, went through a change of drummers; including Pete Best, before asking Starr to join them in 1962. In addition, Manager Brian Epstein moulded them into a professional act, and producer George Martin guided and developed their recordings, greatly expanding the group’s popularity in the UK after their first hit, “Love Me Do”, in late 1962. 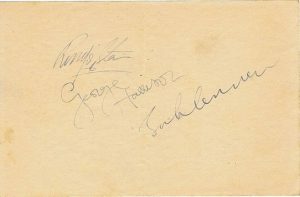 Also, they acquired the nickname “the Fab Four” as Beatlemania grew in Britain over the next year; and by early 1964 became world stars, leading the “British Invasion” of the US pop market. From 1965 onwards, the Beatles produced increasingly innovative recordings, including the albums Rubber Soul (1965), Revolver (1966), Sgt. 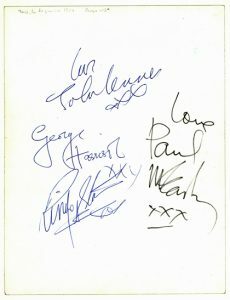 Pepper’s Lonely Hearts Club Band (1967), The Beatles autographs (also known as the “White Album”, 1968) and Abbey Road (1969). Furthermore, after their break-up in 1970, they each enjoyed success as solo artists. John Lennon was shot and killed in December 1980, and Harrison died of lung cancer in November 2001. McCartney and Starr are still active.